The parent or the child? Which one is best for your portfolio depends on your investment goals. 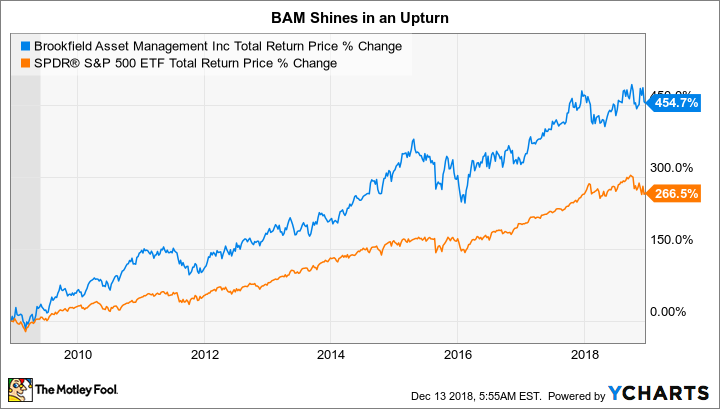 Brookfield Infrastructure Partners (NYSE:BIP) and Brookfield Asset Management (NYSE:BAM) are closely related, as the shared Brookfield name implies. The differences between the two, however, are material when you dig into the companies and, more importantly, their goals. Here's a primer that can help you decide which one is a better buy. Brookfield Asset Management is a Canadian investment company with a 100-year-plus history of managing money for itself and others. Although the dividend has been increased for seven consecutive years, it isn't really focused on generating income. While dividend growth has trended toward the high single digits in recent years, the yield is an uninspiring 1.4%. The current bull market has been very kind to Brookfield Asset Management. As of the third quarter, the company had roughly $140 billion in assets under management that earned fees, up from $82 billion in 2014. This is the key number to watch because, as an asset manager, it earns fees based on how much money it manages. The point of the company is to grow those assets over time. Looking forward, the goal is to increase it at a compound annual rate of 14%, which means hitting roughly $245 billion in the next five years. That can happen in two main ways. First, Brookfield Asset Management can get new clients or more cash from existing clients. Second, the value of the assets it is managing can increase. Both lead to higher fee income. However, both of those will generally trend the same way on the upside...and the downside. To put it a different way, when the market is going up, Brookfield Asset Management is likely to lure more cash into its coffers precisely because the assets it manages will probably be doing well. However, when the market is heading lower, the assets it manages will likely fall in value and investors will be more inclined to pull cash out of the market. Both of those actions will lead to falling fee income. The third quarter of 2018 provides a bit of insight, with fee related earnings up 63% over the trailing 12-month period. However, management notes that the massive increase was largely due to "performance related fees" and a capital raise for a real estate fund. "Performance related fees" can fall away quickly in a bear market/recession and raising capital will become more difficult, too. While it's true that a portion of Brookfield Asset Management's fees are fairly stable (see below), there is still a material amount of variability in its cash flow generation that is tied to the market and the economy. That's not a strike against Brookfield Asset Management. It has a great history of successfully navigating market cycles. And if it can hit its asset under management projections, the company expects to grow fee income by an impressive 18% per year, on average, over the next five years. But you need to go in understanding that the market has had a great run and that's part of the reason why this stock has returned 454.7% over the past decade, including dividends, easily trouncing the S&P 500's return of 266.5%. BAM Total Return Price data by YCharts. During the 2007 to 2009 recession and associated market crash, however, Brookfield lost more than 60% of its value at one point. A key driver of investor skittishness was the 5% decline in the company's assets under management during the worst of the downturn in 2008, with cash flow from operations dropping a massive 25% that year. By the time the recession was over, Brookfield's stock had bounced back a little from the worst of its losses, but was still down nearly 50%. The S&P was down just under 35%, which is bad in its own right but shows how leveraged Brookfield Asset Management's shares are to the ups and downs in the broader market and economy. Brookfield Asset Management's assets under management recovered in 2009 following the end of the recession. That, however, was largely the result of $14 billion in fund raising to take advantage of distressed assets left behind from the downturn. Cash flow from operations, meanwhile, was still well below 2007 levels that year. Economic downturns hurt and the impact is felt in Brookfield Asset Management's financial results and stock price. One of the key ways in which Brookfield Asset Management raises funds is by creating controlled limited partnerships. Most of these entities own and manage physical assets, largely in the infrastructure space. Brookfield Asset Management gets paid a management fee, which tends to be stable over time, to run these businesses, which are often publicly traded. Brookfield Infrastructure Partners is one of these entities. It owns a fairly diverse portfolio spanning the utility, transportation, energy, and data infrastructure arenas. It is also diversified geographically, with roughly 25% of its cash flow coming from North America, 30% from South America, 25% from Europe, and 20% from Asia. The goal of this portfolio is to generate income for unitholders. The distribution yield is currently a generous 5% or so and the annual disbursement has been increased for 11 consecutive years. The partnership's target is to hike the distribution between 5% and 9% each year, a target it has so far managed to achieve. The key difference here is that once Brookfield Infrastructure Partners owns an asset, it doesn't need to worry about the performance of the broader market or its unit price. The fees that asset generates will add to cash flow. That said, the portfolio is actively managed. So Brookfield Infrastructure Partners will be buying and selling assets over time. For example, it sold $1.3 billion worth of assets in 2018 and bought $1.8 billion of new ones. The goal is to buy opportunistically, improve the acquired asset, and sell when it gets a compelling price. With a globally diverse portfolio spread across many industries, it has plenty of opportunities to put that plan into action. And so far it has done a pretty good job of it. The next market downturn, meanwhile, could actually be an opportunity to pick up assets on the cheap. If you are looking at Brookfield Asset Management and Brookfield Infrastructure Partners, you need to understand the key differences between these two entities. If you prefer income, then Infrastructure Partners is the obvious better choice. But there's more to this story than that when you dig in. No one knows what will happen next in the market. However, there appear to be material risks to Brookfield Asset Management's business model with stock prices near all-time highs and market performance increasingly choppy. A market downturn could quickly put its five-year goals out of reach, something to which investors would likely react poorly. The last major downturn is a clear guide on that. Brookfield Infrastructure Partners, meanwhile, is more a steady income investment. But since it owns physical assets, it can keep generating income no matter what the market does. That helps explain why the stock held up better than its parent during the 2007 to 2009 downturn. It's also another reason to prefer it today, based on where the market sits right now.